During Amazon’s annual shareholder meeting on Thursday, May 24, founder and CEO Jeff Bezos was confronted by protesters from Working Washington, a coalition which includes community groups, unions and members of Occupy Seattle. As police evicted demonstrators, Bezos told shareholders that nine out of Amazon’s ten best-selling products were either digital content or digital platforms like the Kindle. 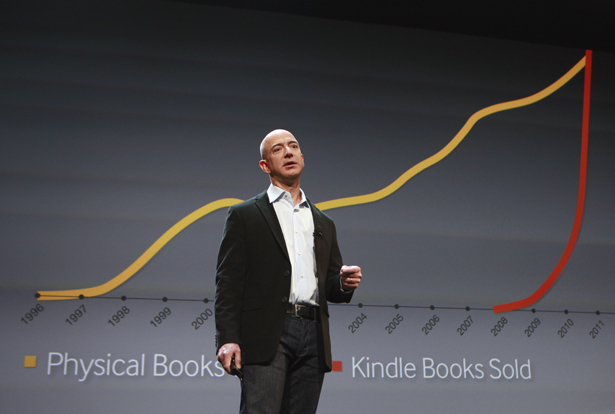 Bezos was making a point: the physical world is being phased out of Amazon’s business plan. The Occupy movement and the protests it has galvanized seem to represent Amazon’s polar opposite. They succeeded where blogging and online activity had faltered, precisely because they were operating in the physical world. But Bezos and his antagonists have more in common than he might think: both have changed the national landscape by coming up with new ways to deliver “products” that had been around for a long time—books and music for Amazon and jobs, opportunity and economic justice for the movement. In their first direct confrontation, Bezos seemed to yield. Was that because, as an innovator, Bezos recognized a new and powerful idea? Or was he just making a tactical retreat until he’s in a better position to fight back? Amazon has also taken heat for its membership in ALEC—the American Legislative Executive Council—a corporate-funded group that backs right-wing politicians. ALEC also drafts and promotes laws like those that effectively disenfranchised large numbers of minority voters, the “Stand Your Ground” legislation that has resulted in the death of Trayvon Martin and a number of other people, and the anti-union laws brought to national attention by Wisconsin Governor Scott Walker. In an even more telling sign of the impact of the protests, the normally loquacious Bezos left without taking questions from reporters. Bezos did not announce that employees in Amazon’s warehouses would receive the benefits they’re due under state and national law, or that Amazon would stop forcing them to declare themselves independent contractors. And Amazon was behind the curve in withdrawing from ALEC, lagging well behind companies such as KFC, Taco Bell, Coca-Cola, Proctor & Gamble, Blue Cross/Blue Shield, Intuit, McDonald’s, PepsiCo and Kraft Foods. Most of these companies left ALEC more than a month ago, when revelations about its role in “Stand Your Ground” gave renewed momentum to demands that corporations leave it. But then, ALEC has treated Amazon very well. It has defended the “Amazon loophole” that allows online sellers to avoid charging sales taxes the way other businesses do. This unfair advantage has given Amazon a lot more clout against neighborhood bookstores and retail book chains—clout it has used to drive many of them out of business. But if the “loophole” explains Amazon’s reluctance to leave ALEC, it also underscores the size of the victory won by protesters today. Jeff Bezos is Amazon, the same way that Steve Jobs was Apple, and he embodies many of the same contradictions. He’s a creative and smart leader who has transformed the world in which he operates. He has real gifts for imagining new ways of doing things and then making them happen. Now Bezos is reportedly experimenting with privately financed space flight though a venture called Blue Origin, which Forbes magazine called “notoriously secretive.” Like the Soviets, Blue Origin never announces its test launches beforehand, so it was only days later that the public discovered what caused a mysterious explosion in the sky over West Texas last year. Bezos recently donated Blue Origin’s first prototype, a rocket-powered ship designed to take off and land without assistance, to a Seattle museum. For reasons that may be clear only to Bezos, the vehicle is named for Charon, the mythological figure who ferried dead souls into the underworld. There’s no word yet on whether Blue Origin’s flight crews will be unionized, but don’t count on it. He’s gifted and often inspiring, but Bezos can also be ruthless and socially irresponsible in pursuit of his goals. A recent report in the Seattle Times noted that, unlike Microsoft and Boeing, Amazon gives virtually nothing to Seattle-area charities. Bezos is a libertarian who reportedly exults in the fact that Amazon’s loophole prevents the government from collecting taxes. He appears to exemplify a certain kind of Internet or computer entrepreneur—call them “digital libertarians”—who can be visionaries in technological and cultural ways and yet blind to social and economic realities. The government funded and created the technology that made them wealthy. It educated their customers (in Bezos’s case by teaching them to read), trained their workforce and protected their personal and business rights. But once they’re successful—and tax time rolls around—the “digital libertarians” conclude that government serves no useful purpose. Why can’t more people succeed without the government like I did? Jeff Bezos has also responded to criticism. Amazon has been blamed for the difficulty faced by new writers who can’t find a publisher because, without local bookstores, it’s hard for new voices develop an audience. That’s why half the people on your next airplane flight will be reading The Girl Who Kicked the Hornets’ Nest. So Amazon created the “Breakthrough Novelists Program” to address the criticisms. From streaming movies to online “cloud” storage, from the risky idea of building Kindle book readers to letting buyers “test-drive” phone apps in its online store, Amazon continues to take chances in the pursuit of technical innovation. Jeff Bezos hasn’t played it safe in business. But it remains to be seen whether he can also be courageous in facing up to his social responsibility, or to the wave of change that was represented at the shareholders’ meeting last week—not by a PowerPoint presentation or a product rollout but by the voices of the protesters who faced arrest to deliver their message.